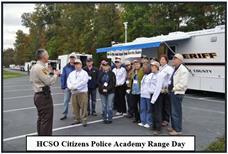 HANOVER, Va. – In 1995, the Hanover County Sheriff's Office began offering the Citizens Police Academy (CPA). The Citizens Police Academy is designed to teach citizens about the law enforcement agency which serves them. The academy is open to Hanover County residents, business owners and county employees who are at least 21 years of age. The academy meets at the Vaughan-Bradley Law Enforcement Building in the fall for 10 consecutive Tuesday evenings, 6:30 p.m. - 9:30 p.m., and one Saturday from 8 a.m.–12 noon at our Firing Range. While offering a transparent overview of each unit within the department, students are not trained to be police officers, but to be informed citizens regarding the aspects of law enforcement. In addition to the overview of each division and hands-on scenarios, participants are also introduced to the department’s various special teams, e.g. High Risk Entry Team, Traffic Safety Team, and Crisis Negotiation Team, while spending a day at our Firing Range learning about firearms safety. Participants are also offered a ride-along with a deputy to experience a typical workday first-hand. To date, over 700 individuals have successfully completed the academy. Once a graduate of the academy, students are eligible to join our Volunteers in Police Service group, which assists the Sheriff’s Office in various volunteer capacities ranging from administrative functions, to traffic control to assisting with special events as needed. An application for the Citizens Police Academy may be obtained by calling 804-365-6825 or visiting http://www.hanoversheriff.com/198/Citizens-Police-Academy. Applications are accepted on a continual basis, or until the approaching class reaches capacity. A background check is conducted on each applicant prior to acceptance into the class. The 27th session of the CPA will begin September 15, 2015.